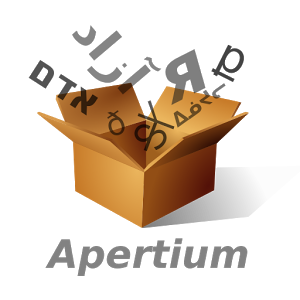 Apertium is a machine translation system that was first created in the project OpenTrad in 2004. A machine translation system is used to translate text from one language to another. Apertium is free and available to everyone. The Apertium software is a generic engine and contains the data for many language pairs. Apertium translates text first by using dictionaries to find the equivalent word in the target language. Apertium then uses rules about the grammar of each language to form coherent sentences. Apertium is one of the best machine translation systems available today and is continually improving.